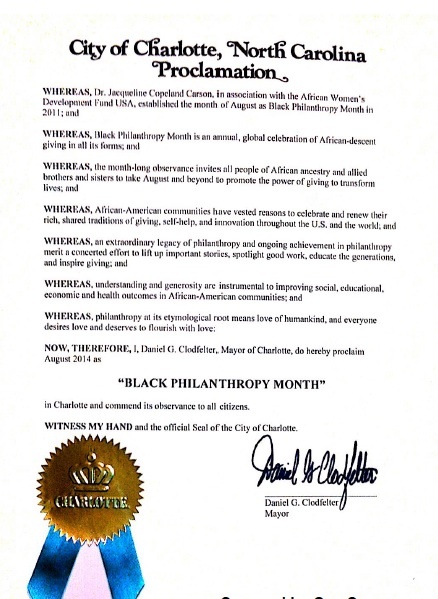 The Honorable Daniel Clodfelter, Mayor of Charlotte, has proclaimed August 2014 as Black Philanthropy Month! At Tuesday’s BPM 2014 :: Forum For Civic Leadership, City Councilman David Howard opened the event by reading the City of Charlotte’s proclamation. And I’m proud to share it with you. If the version below proves illegible, you can also access it via this link: City of Charlotte BPM Proclamation. To recognize the vital role generosity plays in ensuring a healthy, safe and prosperous community in which to live, work and flourish. Black Philanthropy Month. August…and giving augustly, year-round!